The Senator representing Lagos West at the National Assembly, Adeola Olamilekan, has disassociated himself from the recent protest by a group of people from Ogun State to the residences of national leader of All Progressives Congress (APC), Asiwaju Bola Tinubu and that of former Ogun State governor, Chief Olusegun Osoba, in Lagos, urging the duo to ‘release’ him to contest for the governorship of Ogun State in 2019. The Senator, who stated this in a statement signed by his Media Adviser, Kayode Odunaro and made available to newsmen on Tuesday in Abeokuta, said he had over three weeks ago concluded his consultations with party leaders and other stakeholders over the issue of Ogun State governorship race. 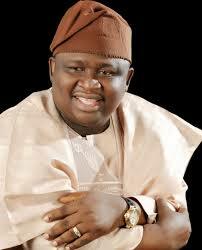 Adeola, otherwise known as Yayi, added that following the consultations, he had shifted his focus on re-contesting his Lagos West Senatorial seat, which according to him “has already received wide endorsement from relevant stakeholders of APC in Lagos West who wanted me to continue with my work in the Senate and Lagos West. “I concluded my consultations in Ogun State over a month ago with a commitment to continue to serve my constituents and political party in Lagos West. The protest to the residence of our National Leader, Asiwaju Tinubu, is embarrassing and presumptuous. It was organised in bad faith. I was not consulted before the protest as the protesters stated themselves. It was not with my support or endorsement. And as late MKO Abiola stated in such a situation, you cannot “shave someone’s head in his absence, “ Senator Adeola further pointed out. He, therefore, appealed to all his admirers to respect his wish to continue to serve the good people of Lagos West Senatorial District, submitting “those behind the protest are against my interest and that of my political party, APC”.